Bompas & Parr specialise in food installations combining art and food. 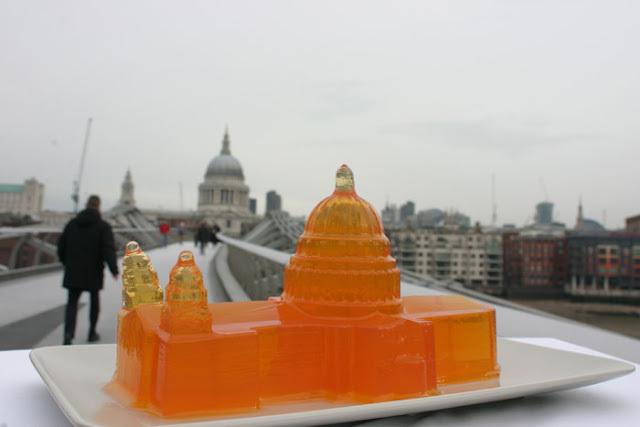 They are known for their experimental art jellies… above is a jelly in the shape of St Pauls cathedral. In the past they have hosted events such as flavour tripping… using a West African fruit called a miracle berry (Synsepalum Dulcificum) which transforms the taste of lemons into toffee and vinegar into sherry. You eat the berries which contain an ingredient called ‘miraculin’ which binds to the taste buds and makes bitter and sour foods taste sweet. The effect last between 20 minutes and two hours. Another event they set up was ‘scratch n sniff cinema’ with Peter Greenaway at the ICA which I sadly missed being busy at The Underground Restaurant. I do possess the original scratch n’ sniff card from John Waters ‘Odorama’ spectacular ‘Polyester’. It’s probably worth something now, but has lost all of it’s smelly properties. No way, I had a go on that scratch n sniff John Waters film once! Sadly it wasn't my DVD. Why didn't scratch n sniff for films ever take off? Yes must dig it out and scan it..